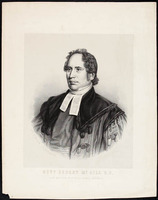 RINTOUL, WILLIAM, Presbyterian minister, missionary, teacher, and editor; b. 31 Oct. 1797 in Kincardine (Kincardine-on-Forth), Scotland, son of Robert Rintoul and Sophia Aitken; m. Christian MacGibbon in Maryport, England, and they had six sons and one daughter; d. 13 Sept. 1851 in Trois-Pistoles, Lower Canada. William Rintoul, the second son of a merchant, was educated at the University of Glasgow. He was ordained by the Church of Scotland’s Presbytery of Dunblane in 1821 after accepting a call from Maryport, England, and while holding that charge he received an ma degree from the University of Edinburgh in 1826. A pamphlet he wrote the same year, called Remarks on the claims of Scotsmen abroad, on the Christian sympathy and exertions of their countrymen at home, revealed his decided interest in missionary work and brought him to the attention of church authorities involved with missions. In 1830 the Glasgow Colonial Society received a letter from William Morris, a prominent Presbyterian in Upper Canada, stating that a Presbyterian congregation newly formed in York (Toronto) needed a Scottish minister “of superior acquirements,” and was proposing an attractive bond of £200 currency per annum for three years. The society offered Rintoul the appointment in September 1830 and he accepted, but delayed sailing until the spring when his twin infant sons could safely travel. The Rintoul family arrived at Quebec on 25 May 1831 and hurried on to Kingston where a convention of Canadian Church of Scotland clergymen was scheduled for 7–8 June. Rintoul attended the second day’s session which saw the formation of the Synod of the Presbyterian Church of Canada in connection with the Church of Scotland, and his own appointment as clerk of its committee for missions. He then proceeded with his family to York. His church, St Andrew’s, was opened for worship on 19 June 1831 and Rintoul, introduced to his ministry by the Reverend Robert McGill, was the first to preach in it. Accommodating 900, it was the home church of the 79th Foot and of many Scottish emigrants, including its designer, John Ewart. Although Rintoul performed his duties faithfully, introducing Sunday schools, minister’s classes, and pastoral visitations, a disagreement with members of his congregation who were irritated by his stiff manners and reading of sermons resulted in his contract not being renewed at the end of its three-year term. After his departure in the spring of 1834 he was temporarily replaced in the pulpit by the Reverend John Bayne until the return from leave in Scotland of the new incumbent, the Reverend William Turnbull Leach*. The developments at St Andrew’s were probably for the best, because it was in missionary work that Rintoul excelled. 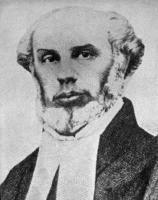 As clerk of the synod’s committee for missions he had travelled throughout Upper Canada searching out Presbyterian communities lacking Church of Scotland clergymen and alerting the Glasgow Colonial Society to their needs in long letters which “had great influence in leading to more active exertions on behalf of the Presbyterian colonists.” He also wrote a lengthy report published in 1835. So successful had he been in such work that on the expiry of his contract at St Andrew’s he was immediately appointed superintendent of missions by his synod. His salary remained at £200, the Glasgow Colonial Society adding £50 to the synod’s offer of £150. In December 1834 Rintoul decided that, while maintaining his missionary post, he would accept a call in the new year to the small Presbyterian congregation at Streetsville (Mississauga), Upper Canada, which the Reverend Andrew Bell was prepared to resign in his favour. In 1836 he was appointed moderator of synod. 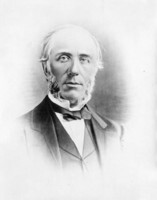 Rintoul’s considerable experience with the difficulty of attracting qualified clergy to Canada was largely responsible for his long-standing interest in the establishment of a Canadian seminarears of effort culminated in his becoming a founder of Queen’s College in Kingston and, in 1840, going to Scotland with the Reverend John Cook* of Quebec to raise funds for the college. Although a sum of about £2,000 was collected, the results were considered disappointing. Moreover, Rintoul’s connection with Queen’s College was to be short-lived. The disruption in the Church of Scotland in 1843 spilled over into Canada and divided the Canadian church the following year [see Robert Burns*]. Queen’s College, which had held its first classes in theology in 1842, remained with the Church of Scotland whereas Rintoul and his Streetsville congregation joined what was popularly called the Free Church, with Rintoul appointed first clerk of synod. In 1847 he resigned from his charge and moved to Toronto where he taught biblical criticism and Hebrew at the Free Church seminary (after 1858 Knox College), until the chair was abolished a few sessions later. Rintoul’s want of occupation and a vacancy at the Scotch Presbyterian Church in Montreal, later known as the St Gabriel Street Church, prompted its congregation to issue him a call; he accepted, and on 3 July 1850 entered into service there with vigour. As always, however, missionary work remained one of his chief interests. 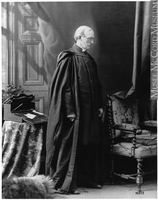 While in Montreal he edited the Ecclesiastical and Missionary Record and undertook missionary travels. In September 1851 while on a trip to Métis (Métis-sur-Mer) on the lower St Lawrence River he contracted what was thought to be cholera and was forced to pause at Trois-Pistoles. Having caught cholera before, he was confident he would recover this time as well, but his condition worsened and he died. One of his sons as well as a physician, both of whom had travelled from Montreal to be with him, obeyed his wishes to be buried in the nearest Protestant cemetery and transferred his remains to Fraserville (Rivière-du-Loup). The obituary in the Globe noted that his wife and one child were believed to be on their way back to Canada from a visit to Scotland and would be greeted on landing with the news of his death. GRO (Edinburgh), Tulliallan, Perth, reg. of births and baptisms, 5 Nov. 1797; reg. of proclamations of marriages, 23 May 1794. UCA, Biog. files; Glasgow Colonial Soc., corr., II (1829–30), nos.174, 206, 219, 223; III (1831–32), no.56; VI (1836–38), no.274; VII (1839–43), nos.5, 96; letter-books, II, Robert Burns to Rintoul, 8 June 1831; minute-books, I, 21 July, 20, 22 Sept., 8 Nov. 1830; 12 Jan. 1831. Croil, Hist. and statistical report (1868), 39–40. Ecclesiastical and Missionary Record for the Presbyterian Church of Canada (Toronto), 7 (1850–51): 182. Glasgow Colonial Soc., Report (Glasgow), 1831: 14–15; 1832: 12–13; 1835: 24. Globe, 20 Sept. 1851. Scott et al., Fasti ecclesiæ scoticanæ, vol.7. 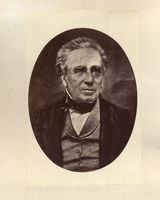 Campbell, Hist. of Scotch Presbyterian Church. Gregg, Hist. of Presbyterian Church. S. C. Parker, The book of St. Andrew’s: a short history of St. Andrew’s Presbyterian Church, Toronto (Toronto, 1930), 10–20. Elizabeth Ann Kerr McDougall, “RINTOUL, WILLIAM,” in Dictionary of Canadian Biography, vol. 8, University of Toronto/Université Laval, 2003–, accessed April 26, 2019, http://www.biographi.ca/en/bio/rintoul_william_8E.html.